Solar Tompkins works to reduce greenhouse gas emissions in Tompkins County by promoting the deployment of solar and wind energy and by facilitating the adoption of home insulation, sealing, and heat pump technologies for heating and cooling. We provide residents with the information, confidence, and value they need to transition their homes toward zero net carbon emissions, and we strengthen local markets for renewable energy and energy efficiency. AT THE EARTH DAY ITHACA COMMUNITY CONVERSATION ON THE FUTURE OF HOUSING HOSTED BY SUSTAINABLE TOMPKINS, SOLAR TOMPKINS RECEIVED A PEOPLE'S CHOICE SIGNS OF SUSTAINABILITY AWARD IN THE 'ORGANIZATION' CATEGORY FOR DEMONSTRATING PROGRESS TOWARD ADVANCING COMMUNITY WELL-BEING, ECOLOGICAL STEWARDSHIP, AND LOCAL ECONOMIC RESILIENCE. After two successful years of focus on rapidly increasing the deployment of solar PV in the residential sector, Solar Tompkins has turned to the promotion of non-fossil fuel alternatives and efficiency measures for home heating and domestic hot water, which, combined, account on average for 75% of the total energy use in Tompkins County homes. The HeatSmart Tompkins campaign accelerates the transition of home-heating away from fossil fuels via deployment of highly efficient air- and ground-source heat pumps in combination with improvement of building efficiency through better insulation and air sealing. This program will be offered in Tompkins County for a third time beginning in late spring 2018. More detail regarding program launch, selected installer partners, and public meeting dates is forthcoming. This is a limited-time program intended to jump-start the rate of homeowners adopting both building envelope and heat pump technologies. Heatsmart Tompkins offers tremendous opportunities and benefits for participating residents. By offering lower-than-market rate pricing and a simple process with vetted Installation Partners, the program makes home energy efficiency easily achievable. Insulation and air sealing, together with an air- or ground-source heat pump system can provide great comfort, immediate cost savings, and have a positive environmental impact against climate change by reducing greenhouse gases emitted as a product of heating with fossil fuels. Further, heat pumps can be powered by renewably-generated electricity which allows the next step toward shrinking household carbon footprints. Air-source heat pump indoor head. Outdoor condenser for air-source heat pump. 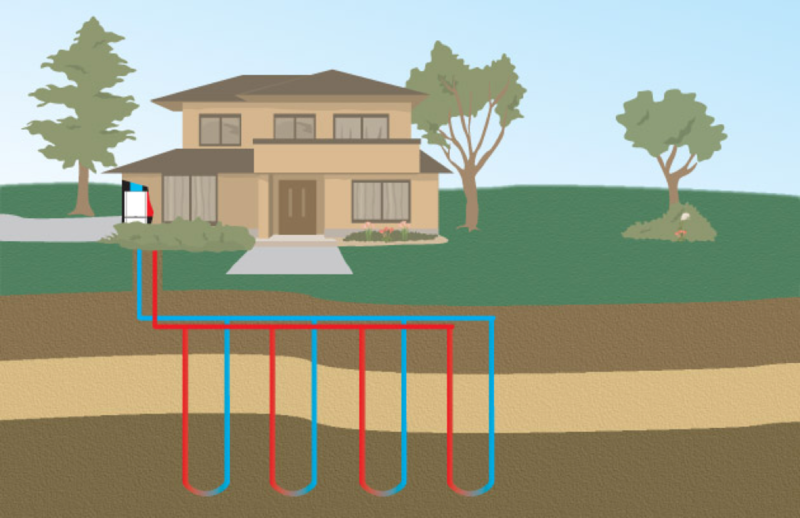 Ground-source (geothermal) heat pump system illustration. Solar Tompkins is a nonprofit community-based organization promoting a pathway to net-zero-carbon homes in Tompkins County, NY. This includes facilitating the adoption of solar and other renewable energy sources, reducing the energy needs of homes while enhancing comfort, and providing affordable, non-fossil-fuel alternatives for home heating, which accounts for 3/4 of the home energy footprint in our cold-winter climate. The Solar Tompkins Board includes volunteer representatives from all 10 towns in Tompkins County, a representative from the Tompkins County Planning Department, and several 'at-large' members chosen for their expertise and knowledge. Funding for Solar Tompkins comes from individual donations and grants, including recent support from the Park Foundation. The Solar Tompkins program has drawn inspiration from successful “Solarize” projects across the country. Our programs feature important elements of the general “Solarize” model (Solarize Guidebook, US DOE 2011), but have been modified to meet local needs and the requirements of scale for the HeatSmart Tompkins program. Our programs lower the barriers to adoption of renewable energy and energy efficiency measures by providing: 1) excellent pricing, 2) a simple process with vetted technology and installation partners, 3) educational outreach throughout the county on the practicality of renewable energy and all-you-need-to-know-made-easy introductions to the technology, and 4) a community-wide program to build enthusiasm and generate the impetus for adoption now! In 2014, Solar Tompkins hosted a very successful county-wide community solar program that far exceeded its goal of doubling the total amount of residential solar PV installed to date in the county, and left the market with a permanently increased annual rate of solar power adoption. In 2015/2016, Solar Tompkins launched the HeatSmart program to accelerate the transition of home-heating away from fossil fuels via deployment of highly efficient air- and ground-source heat pumps in combination with improvement of building efficiency through better insulation and air sealing. In 2017 and 2018, Solar Tompkins conducted HeatSmart II & III in county-wide programs of community meetings and home tours. Stay tuned as we roll out plans for 2019! Interested in volunteering with the HeatSmart Tompkins 2019 program? Click here.